Coatings have become an integral part of various end-use industries, ranging from manufacturing to medical & healthcare. End-user industries have started to realise the advantages of using automotive refinish coatings over conventional paints and coatings. This combined with increased R&D activities have led to the growth of the automotive refinish coatings market. It is expected to grow at a CAGR of 5.3% and 4.5%, by value ($million) and volume (kilotons) respectively between 2016 and 2026. The report is a compilation of the different segments of global automotive refinish coatings market, including market breakdown by product type, vehicle age, technology, resins, auto type, and regional areas. Herein the revenue generated from the product types, namely: basecoats, clearcoat, primer & filter, and others; resins, namely alkyd, acrylic, polyurethane, and epoxy; technology (solvent-borne, waterborne, and UV-cured); auto type (cars, two-wheelers, and commercial vehicles); vehicle age (vehicles aged less than 5 years, vehicles between 5-10 years, and vehicles more than 10 years); and regions, namely: North America, Europe, Asia-Pacific, South America, and Middle East and Africa is tracked to calculate the overall market size, both in terms of value ($million) and volume (kilotons). The report also provides market numbers and analysis on cross segments which includes country by end-user industries. While highlighting the key driving and restraining forces for this market, the report also provides a detailed summary of the global automotive refinish coatings market. It also includes the key participants involved in the industry at the relevant sections. • What is the size, in terms of value ($million) and volume (kilotons) of automotive refinish coatings market in 2016, and growth rate during the forecast period, 2017-2021? • What is the market size of different product types of automotive refinish coatings ($Million and Kilotons) and their growth rate during the forecast period, 2017-2021? • How will different technologies of automotive refinish coatings market grow during the forecast period and what will be the market size ($Million and Kilotons) of each of the end-user industry by the end of 2021? • What is the market size for different regions and countries in terms of value and volume ($Million and Kilotons) in the automotive refinish coatings market and their growth across the forecast period, 2017 to 2021? • What is the market share of different types of automotive refinish coatings on basis of auto type and their growth rate during the forecast period, 2016-2021? • What is the market share of automotive refinish coatings on basis of vehicle age and their growth rate during the forecast period, 2016-2021? • What are the major driving forces that tend to increase the demand for automotive refinish coatings market during the forecast period? • What are the major challenges inhibiting the growth of the global automotive refinish coatings market? • What is the competitive strength of key players in the global automotive refinish coatings market by analysing through market share analysis? • What are the key market players in the automotive refinish coatings market, along with their detailed analysis & profiles (including their financials, company snapshots, key products & services, and SWOT analysis)? Further, the report includes an exhaustive analysis of the regional split into North America, Europe, Asia-Pacific (APAC), South America, and Middle East and Africa. Each region details the individual push and pull forces in addition to the key players from that region. The prominent players operating in the global automotive refinish coatings market are include Axalta Coatings Systems, PPG Industries Inc., AkzoNobel N.V., BASF SE, Sherwin Williams, KCC Paints, Covestro, Berger Paints, Kansai Paint, Nippon Paint, NOROO Paint, Lubrizol Corporation, S.Coat, and Diamond Vogel, among others. 11.2 Axalta Coating Systems Ltd.
11.6 Kansai Paints Co. Ltd.
11.7 KAPCI Coating Co. Ltd.
11.10 NOROO Paint & Coatings Co. Ltd.
11.11 Nippon Paint Holding Co. Ltd.
11.15 Berger Paints India Ltd. The advent of the technological era has made the extensive usage of paints and coatings a possibility for several end-user industries including manufacturing, medical & healthcare, and especially the automotive industry. Earlier, paints and coatings were used only for decorative purposes, but over the years, the end-user industries have realized that these products can be made functional to endow the substrates with various desirable properties such as anti-corrosiveness, ultraviolet protection, and others. The conventional paints and coatings industry uses various chemicals, including the toxic hexavalent chromium, to obtain such properties. But with the rising environmental concerns, the industries are seeking more environment friendly solutions since most of these chemicals are non-biodegradable, polluting, and harmful for the environment. Refinish coatings are a perfect solution for the aforementioned problem. These coatings are more efficient when compared with the conventional coatings as they enhance the exterior appearance of the substrate, and provide increased durability to the vehicles against harsh conditions such as heat, cold, UV radiation, corrosion, collision, and grift from the roads. In terms of value, global automotive refinish coatings market was estimated at $7,850.0 million in 2016, and is expected to register a CAGR of 5.3% from 2016 to 2021. In terms of volume, the global automotive refinish coatings market is expected to register a CAGR of 4.5% between 2016 and 2021. The growth is attributed to the rising disposable income, increasing number of vehicle collisions, growing demand for recreational vehicles, and increase in the average age of vehicles, among others. However, stringent regulations for volatile organic compound (VOC) emissions, and lack of skilled professionals are some of the factors hampering the growth of the global automotive refinish coatings market. 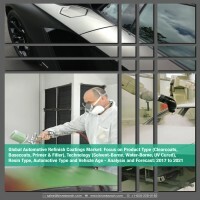 The development of environment friendly technologies, increasing number of rental car owners and used car markets, and the growing demand from the emerging economies such as China, India, Japan, and Brazil, among others, are expected to create opportunities for the growth of the global automotive refinish coatings market. The global automotive refinish coatings market has been divided into 4 segments on the basis of product type, namely basecoats, clearcoats, primers and fillers, and ‘others’. In 2016, clearcoats based refinish coatings dominated the global automotive refinish coatings market with a share of 40.0%, and 38.5%, by value, and volume, respectively. The major factors attributing to this robust growth are the increasing average age of vehicles, and the rising automotive collision rate. The final coating, known as clearcoat, is done on the automobile surface in order to protect the basecoat, and provide aesthetic look, durability, protection against environmental damages, and scratch resistance to the overall coating. On the basis of resins, the global automotive refinish coatings market is segmented into alkyd, acrylic, polyurethane, epoxy, and ‘others’. Some of the companies providing polyurethane based refinish coatings have been undertaking numerous business development strategies such as launching new and innovative products, and business expansions. For instance, in November, 2017, Covestro AG begun the production of aqueous polyurethane dispersions (PUDs) in its new production facility at Dormagen site. THE PDUs are used for variety of applications. Various technologies such as solvent-borne, waterborne, and UV-cured are utilized by the automotive body shops and repair centres for the refinishing of automotive vehicle parts. In the global automotive refinish coatings market, the solvent-borne technology based coatings segment accounted for a share of 48.0% in 2016. This growth can be attributed to the advantageous properties of using solvent-borne technology based automotive refinish coatings such as higher gloss retention, excellent block resistance, tolerance to adverse weather conditions, and good adhesion, among others. Refinish coatings are being widely employed for various vehicles such as cars, commercial vehicles, and two wheelers, among others. Automotive refinish coatings are used on passenger vehicles to endow them with similar mechanical and optical properties as provided by the factory applied coatings. The rental car service industry is also growing at a robust rate globally, especially in the emerging economies such as Latin America, India, China, Brazil, and others. For instance, in China, the total number of rental cars in 2015 was 430,000, an increase of 7% as compared to 400,000 in 2014. The increased demand for rental car services, globally, is driving the growth of the global automotive refinish coatings market since these vehicles are mainly used cars and need proper maintenance from time to time. The refinish coatings market for vehicles with age less than 5 years is expected to grow in all the regions. The major factor attributing to the growth of the refinish coatings market for vehicles less than 5 years of age is the rise in the disposable income across several countries, especially in the emerging economies of Asia pacific. The rise in the disposable income is driving the sales of new vehicles, thereby increasing the congestion on roads. This has led to an increase in the number of collisions which is driving the market for automotive refinish coatings. The competitive landscape for the automotive refinish coatings market demonstrates an inclination towards companies adopting strategies to expand their business and focusing on research and development activities. Some of the major established players in the automotive refinish coatings market, are focusing more on business expansion & contracts to keep a strong hold on the market. Axalta Coatings Systems, PPG Industries Inc., AkzoNobel N.V., BASF SE, Sherwin Williams, KCC Paints, Covestro, Berger Paints, Kansai Paint, Nippon Paint, NOROO Paint, Lubrizol Corporation, S.Coat, and Diamond Vogel, among others are some of the prominent companies in the global automotive refinish coatings market. These companies are actively aiming at an increased number of agreements, partnerships, & collaborations, and products to expand their operations, thereby, enhancing their share in the nanocoatings market. These companies expanded their business in different countries to expand their customer base in the market.